As a concessionaire, L&T has thus far invested about Rs 13,000 crore of the Rs 14,132 crore elevated metro rail project taken up under the public, private partnership. Hyderabad: Construction and infrastructure major L&T hinted at investing about Rs 2500 crore more to complete the ongoing Hyderabad metro rail project. As a concessionaire, L&T has thus far invested about Rs 13,000 crore of the Rs 14,132 crore elevated metro rail project taken up under the public, private partnership. And the Telangana Government has invested more than Rs 2300 crore for land acquisition, right of way and related infrastructure to facilitate the project completion. Of the 72 km elevated metro rail, thus far a stretch of 45 km spanning two corridors has been completed, and the stretch connecting the Hitec City, the IT hub of Hyderabad, is at the advanced stage of completion. According to NVS Reddy, Managing Director of Hyderabad Metro Rail Limited (HMRL) and KVB Reddy, Managing Director and CEO of L&T Metro Rail Hyderabad Limited, efforts are on to complete the Hitec City stretch by December and the third corridor between Secunderabad and MGBS, by the second half of 2019. With this, the project will see the completion of 66 km. However, the Old City section connecting Falaknuma will take some more time as there have been issues relating to the right of way, they explained. The L&T has set apart equity of Rs 3,000 crore and raised a debt of Rs 12,000 crore for the metro. The project will need to tackle interest of about Rs 1200 crore per annum when it is fully ready, NVS Reddy stated. Mentioning about metro progress and its role in transforming Hyderabad into a modern city, they said not just the metro, but the entire project is aimed at bringing about urban rejuvenation. 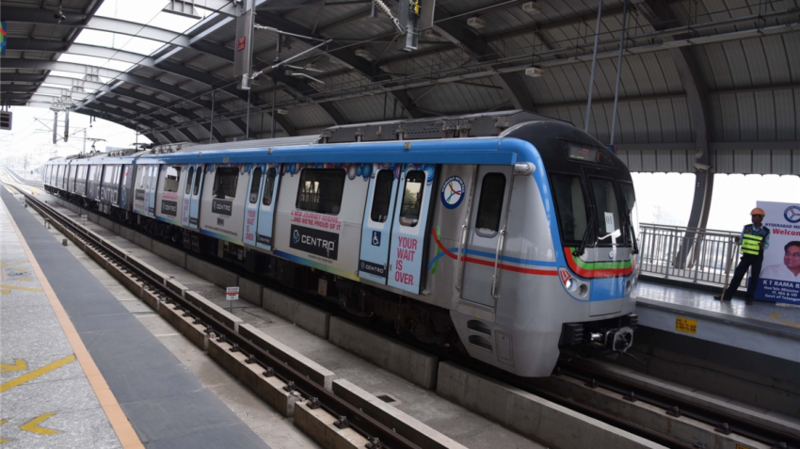 NVS Reddy said that the detailed project report for phase II of Hyderabad metro, which seeks to connect the International airport at Shamshabad and other lines, is expected to be ready soon. The Telangana Government is planning to link the airport from two sections, and the second phase is aimed at taking this up. NVS Reddy said that Hyderabad metro has been shortlisted amongst best 15 metro rails in the world. Of the 15 metros chosen for the survey by a UK based firm, Hyderabad metro ranks high and expected to notch up a high ranking. French company, Kiolis today said its satisfaction survey of 15 metros had shown outstanding results for Hyderabad metro.